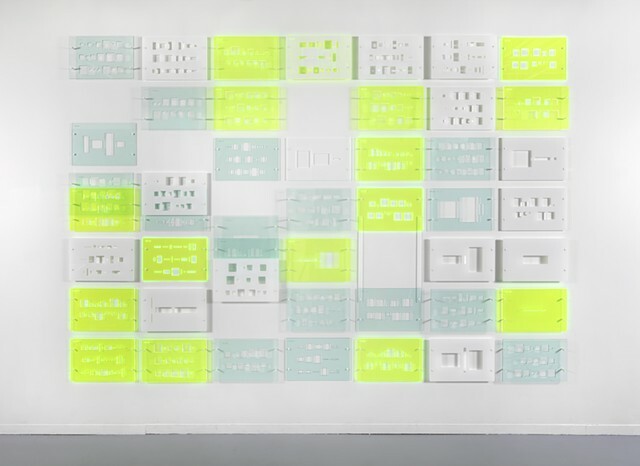 Codex: pi 1021 consists of 48 acrylic panels, attached to the wall as a grid of 7 rows and 7 columns, hung 2” apart, with overall dimensions of 92.5” top to bottom and 134.5” across. Each panel measures 11.5” x 17.5”. Four all-purpose screws with white caps and white nylon spacers are assigned to each panel. Spacer depth varies from ¼” to 1 ¼”. Panels allude to design templates, coded tablets, or pages. Sequence from pi determines color and pattern placement using three different colors of acrylic sheet (clear with green edge, fluorescent green, 31% light transmission white) and four different, yet related, pattern notation. Sequence is run top to bottom/left to right. Simple geometric shapes plot numerical values following, in sequence, the first 1021 digits of pi. Zeros within the sequence shift panels to open spaces within the grid. Laser-cut 1/8" acrylic sheet, capped hardware, nylon spacers. 92.5" x 134.5" x 1.5"